Should I Hire a Commercial Snow Management Company? One of the largest problems with snow and winter storms is that they often sneak up and hit you the hardest when you are unprepared. When you own a business, it is crucial that Old Man Winter doesn’t create problems that could be fatal to your company. Failing to properly remove snow from your business’s property in a timely manner can create a host of problems that could be considered negligent should an accident occur. Are your walkways properly cleared? Will melting snow turn to ice overnight? Is the parking lot clear of snow and properly sanded? This winter, don’t leave it up to chance. Parking Lot Plowing: If your business has a parking lot or driveway, this is one of the first and most crucial areas that must be cleared of snow. Walkway clearing: Walkways and entrances are also critically important to clear of snow. A slip or fall from one of your employees or customers could cost you, and is certainly not worth the risk. Ice Control Systems: Snow that melts and refreezes can create a host of problems if not dealt with in an efficient manner. Ice control helps to keep major walkways and areas of traffic clear of a slippery situation. Snow Removal and Relocation: Do you have space at your business for snow piles? Will snow drifts from the piles create further problems for your parking lot or walkways? Snow relocation involves moving the snow from your parking lot or walkways off site, so that you do not have to worry about snow drifts or unsightly snow piles on your property. There are a lot of factors that will play into the cost of snow removal for your business. Before calling for a snow removal estimate, think about the process of snow removal and how it will function for your business. How large is your parking lot? Do you want your parking lot, walkways, and entrances to be cleared as well as sanded and salted? Do you have the space for snow piles? Should the snow be taken off site? Remember, it is also important to consider when and how often you want your snow removal company to plow. 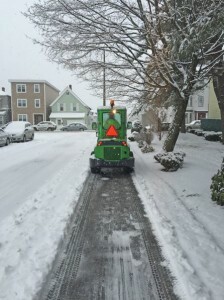 If you are a large business or apartment community, it is in your best interest to sign a contract with your snow removal company so that you do not find yourself scrambling for snow removal at the last minute. At Greener Horizon, we specialize in all of the snow removal areas that are listed above. If you are unsure that a seasonal contract is right for you, we also offer per storm and hourly rates for snow removal. Not to mention, 24 hour storm monitoring! For more information about commercial snow and ice management with Greener Horizon, visit our website. Or learn more about snow removal and landscape management by reading our blog!